A Vermont woman is close to the end of a multi-river canoe trip from Lake Seboomook, north of Greenville, to Fairfield. SKOWHEGAN — Emily Turner glided a 16-foot canoe she built herself softly into the small canoe portage in the South Channel of the Kennebec River on Tuesday afternoon, close to the end of an eight-week, 500-mile trek along Maine’s wilderness rivers. Turner, 26, of Vermont, paddled and long-poled her way in a loop from Lake Seboomook, north of Greenville, up the North Branch of the Penobscot River, down the St. John River, up the Allagash River, back into the West Branch of the Penobscot, down into Moosehead Lake and into the Kennebec River. 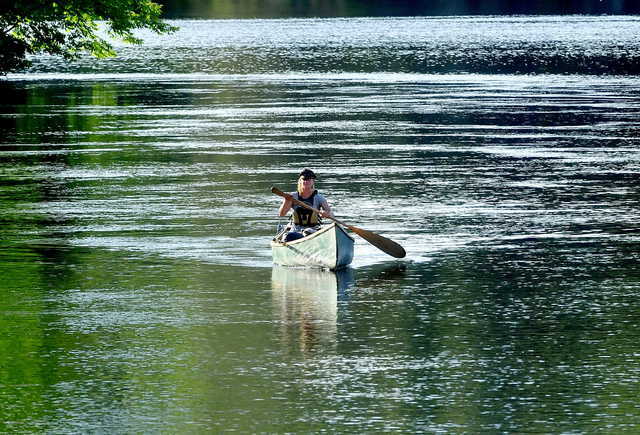 She got a ride around the white water rapids of the Kennebec Gorge and put back into the river at Carry Brook, paddling her way south to Solon and to Skowhegan on Tuesday, where she stopped for an ice cream at the Dairy Treat on Island Avenue near the boat launch. She got another ride from Jim Sylvester, of Skowhegan, to the boat landing south of Skowhegan and planned to camp the night on an island before completing her trip at the Hinckley boat landing in Fairfield. She made the trek by herself, camping each night on the riverbanks without a GPS device or a cellphone. She said she averaged about eight hours a day on the rivers and had to carry her 60-pound canoe and supplies in several locations. The cedar-and-canvas canoe was made in three shops in Vermont and in Newry and Canaan, Maine, in June, just before she launched her trip. Turner, who attended college in England and Norway, works in as a guide in Maine and New Hampshire, taking high school students on long wilderness expeditions. So, why take a 500-mile, solo canoe trip through the wilds of Maine? “To better know myself,” she said.